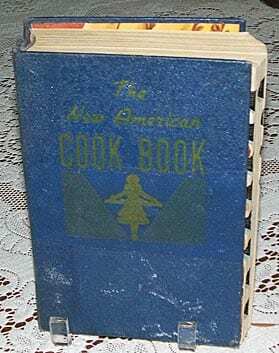 Lily Wallace New American Cook Book, 1941, 1945: Copyrighted first edition was published in 1941. This copy is from the 1943 printing. I’m pricing this as a cook’s copy, but it is a strange one. The outside has a great deal of shelf wear, and I’ve mended the hinges with librarian’s tape. But inside the pages are almost completely clean. 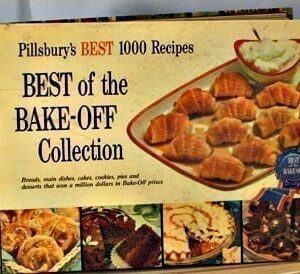 As if the cookbook was almost never used. Clay coated pages. 931 pages. Pages universally tanned at the edges. 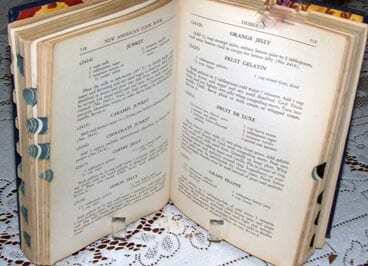 A few hand written recipes included. Great illustrations. Thumb indexed.